During the last few years I’ve presented at schools and conferences in Alabama, Arizona, California, Colorado, Florida, Georgia, Indiana, Illinois, Kansas, Missouri, Massachusetts, Montana, New York, New Jersey, Ohio, Oklahoma, Oregon, Pennsylvania, South Carolina, South Dakota, Texas, Tennessee, Vermont, Wyoming, Puerto Rico, Spain, Colombia, and Bangladesh. My first book grew out of a challenge to write a kids book about cycles, a topic that had not been written about before. I started drawing and writing, night after night for two months, and the book soon took shape. In my program I share this story and others, to illustrate how a book is made, step by step, from the hatching of an idea to selling it at a bookstore. My props are the real stuff—drafts of art and writing, a book galley, proofs, a press sheet and the books themselves. I share works in progress and demonstrate how I draw my book characters. I am comfortable working with all ages of school children and modify my program to suit each school's needs. In a full day visit I present three to four assemblies. I charge a daily fee, which is discounted when I visit more than one school in a region. Contact me at meross@att.net for fee information. There are also additional travel expenses for visits that require an overnight stay. I also present an early childhood science inservice program for staff and parents based on my book, Sandbox Scientist. If you would like me to visit your school or are interested in more information please e-mail me at meross@att.net. $995 per day plus travel expense. (discounts for multiple days in a district or town). Will present a combination of 3-4 assemblies/workshops each day. "We recently had Mr. Ross visit our school and he did a tremendous job! He tailored his presentations to three different grade level groups (K-1, 2-3, & 4-5) and kept the students engaged and enthusiastic. He told about how he began writing as a young chld, how a book gets written, illustrated and published, then shared several of his books as part of the presentation. He ended his presentation asking students to picture themselves as writers. Our students and teachers enjoyed both his books and his presentation. A bonus: Mrs. Ross came along and totally coordinated the book sales and autograph signing session. "Well, thank YOU so much for the wonderful work and friendship. We totally enjoyed having you and Lisa here, my staff are very happy they had theopportunity to work with someone like you. The experience we had at theFiesta del Libro in general has been evaluated very positively, and your contribution has been very valuable in every way." “Our students were enthralled with their author visit from Michael Elsohn Ross. He has a relaxed, easy manner with the students, and his presentation combined fascinating personal stories with hard science, proving that learning is fun! Since his visit, I can’t keep Rolypolyology on the shelves, and his sketch of the teacher that looked like a monkey hangs in our library, still sparking discussion of his visit weeks later." "Organizing Michael’s visit to our campus was easy because he provided a format to prepare that was easy and simple to follow. Our parent organization funded these assemblies and they also helped organize the book sales. Not much help was needed however because of the staff he brought to help. The impression he left with the students is a lasting one. A full week later students were still talking about his books. He held the attention of all levels and encouraged a love of books in a very fun manner. Michael’s visit to our campus was a great part of our Read Across America Celebration." "Michael Ross spent two days visiting two Escondido, California schools. He met with over 1,200 students in grades K to 5 – providing them with insight into the writer’s process and helping them enjoy learning about science topics. His beautifully written and illustrated books appealed to the students as much as his fun-filled ways of interacting with them. Assistance League Inland North County provided the funds to bring Michael to these two schools through its reading motivation program called Ready….Set…Read! We hope to have him back again in the future!" “Boy- our staff was really impressed! I have heard so much praise for both you and your presentation. So many kids returned to their classrooms all fired up and wanting to write. That's got to be the best compliment for sure! Two teachers told me that you were ‘our best ever!" "Our school was lucky enough to have Michael Ross come for a visit. The students really enjoyed his presentation. He showed them the steps he has to go through in order to get a book published and how the illustrations are made as well. They enjoyed his drawing that he made during the presentation as well as the stories behind them. I loved how he was able to connect to so many different grade levels and I liked that he wrote about fiction and non fiction topics. We had a lot of fun and I highly recommend him for an author visit at any school.."
"We had the special privilege of a school visit from Michael Ross this past January. We were thrilled that Michael was willing to visit us in cold, northeastern Montana! It was a chilly -15 degrees on the day of his arrival! Michael gave 4 wonderful sectionals the day of his visit. Each presentation was so perfectly geared to the age level he was speaking to. He relates well to all ages. We concluded our day with a family presentation in the evening! We had an excellent turnout! A special touch that Michael adds to his presentation is picture drawing! It put a perfect finale to his assemblies and made great giveaways for the students! I highly recommend a visit from Michael to your school. His visit will ensure that your kids will go BUGGY for BOOKS for the rest of the year." "Thanks for coming and sharing with us. The day was enjoyed by all!" "Michael Elsohn Ross presented at the Mountain Brook Writers’ Festival. His presentation opened our students’ eyes, as well as those of our teachers, to the world around us. During his visit, we were given the opportunity to learn about his writing style, process, and success. We also loved seeing his illustrations! The K-6 students were given time to read and share many of Ross’ works before, during, and after his visit. It was our great pleasure to have Michael Ross at Cherokee Bend." "Elmwood Elementary School had the honor of an Author Visit by Mr. Ross. He was simply outstanding! Our students and staff were greatly impressed with his interactions. His presentation was very organized and really fun!! Our students were actively involved and learned quite a lot from his books. I whole heartedly recommend Michael Ross as an visiting author!!!" "Michael Ross visited our elementary school this year and it was great! He was able to gear his presentations to the various grades, while at the same time inspiring kids to actually study the world around them. His books encourage children to follow their interests with both a scientific curiosity and a spirit of adventure. I would highly recommend him for other schools." "Michael Elsohn Ross opened wide eyes with nature inspired settings, insects, mammals, energy, and water. His glowing interaction with our multi-ethnic, K-5 students contained songs, questioning, live art, and accessible content which rooted an authoring bug in us all. Michael was very well prepared to thoroughly engage our diverse ELL population with relevant, familiar science topics. His visit included 3 Napa County schools, as well as the Reading Association Author Dinner. Our community and curiosity were tremendously enriched with his friendly presence and educated experiences." "Michael Ross is an excellent author who gives an exciting presentation. His programs are appropriate for all ages and child centered. Michael engages the students and encourages them to write and become authors. He is very well organized and also a pleasure to work with. I highly recommend Michael for school presentations." "Fantastic! Thank you so much for such a great day of reading, drawing, singing and learning. You are an excellent speaker and the presentations were age appropriate, interactive and fun. The students, staff and parents were all engaged. You are informative about the publishing process and inspiring to our future authors. We highly recommend you to any school to enhance their reading and literacy programs." "Michael Ross’ very engaging and knowledgeable assemblies were perfect for both our English and Spanish speaking students. Several of our teachers commented that Michael was wonderful about adjusting his presentations so that he spoke age appropriately. Hands-down, he was wonderful! Our students enjoyed his humorous stories from his childhood, as well as his funny drawings, and his hilarious camp songs. He also was one of our featured authors at the Oregon Educational Media Association’s annual Fall Conference, and was quite successful!" "What a wonderful presentation! When our teachers saw Michael, they immediately put in requests for his titles for our library. Michael presents his science and nature-themed work in such a fun and interesting way, students can't help but be hooked. His entertaining and informative books really fill a much needed void in children's literature." "Mr. Ross visited our school for an author presentation in our library. He was well received by our kindergarteners and first graders. They enjoyed his story telling and held their attention with his talk about science, Yosemite, and books. The students enjoyed him drawing his illustrations of a raindrop. Keeping 100 5-7 year olds engaged for 30 minutes is not an easy trick. His genuine love of science and learning was evident in his presentation. I think he speaks well and relates to young children and I would recommend him highly as a guest author." 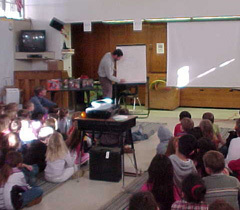 "Michael’s visit as El Carmelo Elementary’s “Visiting Author” for 2006 was a highlight for teachers and students alike. He connected with the students (both Spanish and English speakers) and captured their full attention. Clearly a gifted teacher as well as writer, he deftly tailored his presentation according to the grade levels he was addressing. His artwork, stories and even songs make him a “must have” Visiting Author." 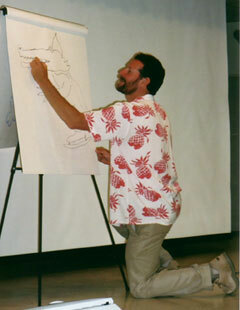 "Michael Ross’ presentations at three Sacramento-area elementary schools were wonderful! After watching the interactions with and responses to him, it was obvious both the staff and K-6 students at each of the schools were delighted by his visit. Experiencing an author presentation is a very important and unique opportunity for readers and writers of all ages. Michael Ross’ writing brings a dimension to the understanding of the natural world that the students at the schools he visits will not soon forget." "The students and staff at Natoma Station thoroughly enjoyed interacting with Michael during his visit. He immediately connected with the students at the first assembly and carried it through to the end of the hectic day. The assemblies were perfectly geared to his audience. His program enthralled the primary students, and he had many of the intermediate students thinking of careers in writing, drawing or nature studies. The students enjoyed the artwork he quickly drew for them, and were thrilled that he left a drawing for them to color. He visited our kindergarten rooms, as well as a special education classroom, and he patiently answered each question. He tirelessly signed book after book during the autograph sessions, making a point to engage each student in a personal dialog when they handed him their book to sign. Even at lunch, he got up from his table to visit with the students. We were all thrilled with his presentations, and his easy-going nature left us with the feeling that we had just made a new friend. The students talked about his visit for days afterwards! A great Author!" "Your visit in Sacramento was a huge success. The schools just loved your books and presentations. I love the way you adapt so easily to each age group. I love your focus on science because the schools are giving science so little time these days, which I think is so sad. My grandsons love bugs and things and we drag out your-Ology books every time we come across a worm, ladybug, sow bugs, etc. I hope that their enthusiasm isn't stifled when they get to school. As the person who selected and contacted you, I want to thank you for coming to our area. You have quite a fan club in Sacramento." "Mr. Ross is an excellent visiting author! He related to all grade levels from Pre-K to 5th grade. The kids were so excited about a real author who made science fun and interesting. The teachers were inspired by his ability to relate and integrate science into the curriculum. Mr. Ross was organized and willing to be flexible with scheduling all day! He sold lots of books too! Yes! What a joy to have an easygoing, interesting, and knowledgeable presenter." "Michael Ross visited our school and several area schools the week of March 20, 2006. He was very flexible and patient with our weather and schedule. Chamberlain and the surrounding area experienced a significant winter storm which interfered with Mr. Ross’s schedule. However, he was very understanding and went out of his way to make sure that all of the schools were able to spend time with him. Mr. Ross’s presentations were outstanding. He involved all age level of kids and was very in tune to their level of understanding. I feel that Mr. Ross’s visit was an excellent way for kids to experience books and the writing process. I highly recommend Mr. Ross for future school visits." "Thanks so much for working with us on making your visit happen. You communicated values of stewardship, self-expression, discipline, and perseverance, values which underpin the Montessori philosophy as well as my own. It make so much sense to have you here. I know you inspired many children and adults alike." "Michael Ross is a wonderful presenter. He tailors his presentations to fit his audience and he captures their attention right at the start. The students enjoyed learning about the book publishing process and Michael did a great job answering their questions. I heard many positive comments from teachers. Thank you, Michael, for helping to kick off our school-wide, young authors’ project. You really excited the kids and helped them realize how much effort goes into creating a good book." "The students at our school recently got to listen to Michael Ross describe how he writes his books. He also gave a preview of several of his works, explaining where the various ideas originated. In addition, he also drew sketches of some of the characters on chart paper, which fascinated many of the students. The three presentations by Michael Ross began a five-week writing project called Young Authors. Each student in the school will write a book. The finished project will be in a blank hardcover book for each student to keep. Mr. Ross was very easy to schedule via his website. He was in email communication with the school principal and me from the date of scheduling until his appearance. He provided suggestions to maximize his visit and a preorder booklist on which the students could order any of his works and have the selections autographed by Mr. Ross. His presentations went very smoothly. Students and staff thoroughly enjoyed the day! " "Thank you for your wonderful presentation at our school. The students and teachers alike enjoyed the program." "What a fun and joyous visit Michael Ross was for our students and staff. After Michael spoke to our students there was a buzz on the playground as children were talking about bugs, looking for bugs, and collecting them. Michael’s enthusiasm about writing and illustrating books is an inspiration to budding writers, children and adults alike. I highly recommend Michael Ross for a school presentation." "I would highly recommend Michael Ross to speak to elementary school children. Not only was he wonderful with the children, but he also made it very easy to coordinate his visit. He visited our school at a very unfortunate time. Our school was in turmoil at the time. Key West had just been hit by one of its most intense hurricanes. It was so intense that our school had to literally take in an entire elementary school that had been too badly flooded. Even with many last minute arrangements and adjustments to his schedule, Michael did a wonderful job and most importantly displayed happiness and enjoyment the entire time even though his hosting school was less than normal at the time. Thank you! Center. They are still commenting on him. One class even mimicked his drawings as soon as leaving his show." published. Mr. Ross was a pleasure to work with." sketches kept all of the students involved. I highly recommend Michael Ross as a presenter at any elementary school. "The program was very unique in tying science with reading and artwork! A thoroughly enjoyable assembly". "Thank you so much for joining us on Authors Day at St. James School this year. The students really enjoyed meeting you and hearing you talk about your work. I distributed the drawing you did to the 2nd, 3rd, and 4th grade classrooms and they were thrilled! "Mr. Ross was a wonderful celebrity at our school. We studied his books before he came and by the time of his visit he was famous, and he lived up to his fame. He was great with our children, particularly the younger ones, and they hung on every word. "Mr. Ross please accept praise for your many appearances at Cloverland School today. Your high quality books are perfectly suited to our young readers. You are a gifted speaker who captures student interest quickly with clear explanations of writing. Your enjoyment of writing is motivating and inspiring as the result of your talent and skill. Children loved your stories and watching you draw. Tou make writing a book look like fun, which is "step one". " I was delighted to hear of the impact your visit had on our learning long after your visit. Thanks for such wonderful science materials for our ‘little folks'. "Mr. Ross was very well received by our students. He has a program tailored to fit his audience from kindergarten on up. Our kindergarteners loved participating with him during his Native American based storytelling. Older students enjoy seeing him produce his artwork right in front of them and are even more impressed when it appears on display in the school! Teachers were impressed that their students appeared encouraged to write on their own after his presentation. Students feel they can approach him with questions and certainly do." "What a joy to have Michael Elsohn Ross visit our school! He was able to keep students interested and involved, whatever their grade level. Our students and staff really enjoyed hearing him talk about the writing process and how he gets ideas for books. His slide presentation was fun and evoked great questions from the students. Mr. Ross was very easy to work with and extremely well organized...would definitely recommend him to any school that is planning an author visit." "The kids absoulutely loved his visit". "Thank you so much for your visit. You exposed the students to so many things that are new to them. It was the perfect balance of ideas and activities to engage and inspire the wide range of students. I like that we had everyone from EL to AP students." "Both the students and staff raved about the presentations, calling them some of the best ever at Blossom Valley. Mr.. Ross was engaging, entertaining and supplied students with valuable information about being a writer. This information will be of great assistance in the ongoing implementation of our school wide writing process. I would recommend Mr.. Ross' presentation without reservation and I look forward to him coming back to Blossom Valley in the near future." "We went to see Michael Ross today. He was great. He was wonderful! He was perfect"
"Michael Ross is an excellent choice as a visiting author. He has written on a wide variety of topics, interacts with children well, and he is flexible with scheduling. His science books will be of special interest to children as he takes students through the writing process. The staff is still talking about what a great experience it was for our students." "Our students enjoyed Mr. Ross' assemblies very much. His slides and illustration demonstrations helped our students better understand how an author translates his thoughts into a published piece. Mr. Ross has a unique ability to appropriately modify his presentation and expression to different age levels. We would enjoy having him return again." "Captivating and fun! Michael Elsohn Ross captivated the children with his bugs and inchworm tale and with his close-up engaging manner of presentation. His work is refreshingly educational and informative and packed with humor and joyful character." "Michael Ross visited Wasuma Elementary in April. He did an excellent job in his presentations to all of our grade levels. Michael was able to hold the interest of Kindergarten through 8th grade students  smoothly tailoring his message to the needs of each age-level. Michael was also willing to accommodate us in terms of scheduling. I would heartily recommend Michael Ross to any school contemplating having an author visit their campus." "It was a grand day when Michael Ross visited Blue Ridge Elementary school. Our students were spellbound with his storytelling and enjoyed learning the process he went through writing his books. Showing slides and drawing illustrations as he shared with each group, made his presentations exciting for all. Our teachers were very pleased that he came to our school. Michael Ross was well-organized and easy to work with when setting up the details of his visit." "Mr. Ross excels at integrating his knowledge of science with the writing process and the art of story telling. Our kindergarten through 6th grade students responded with enthusiasm to his multimedia presentation."